Based on the numbers on the screen, it looks like your income is in the range of $9,325 to $37,950 per year. This puts you in the 15% tax bracket. 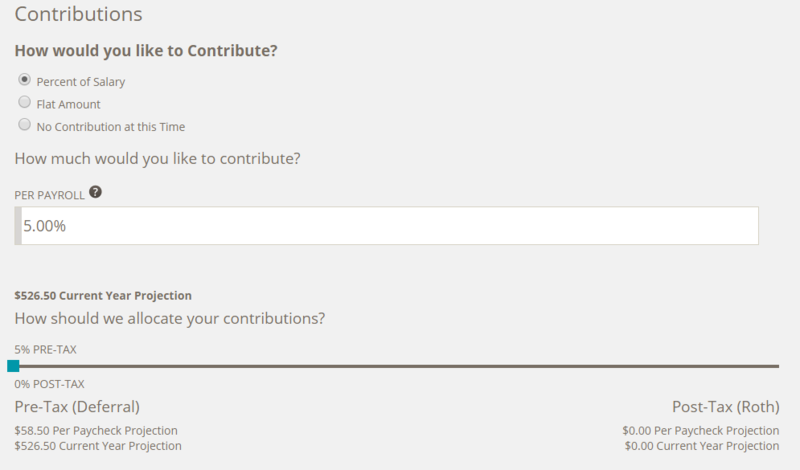 I personally would recommend you move the slider all the way to the right and put your entire contribution into the 401K Roth (so you'll have 0% pre tax and 100% post tax.) The reasoning here is that you'll pay the 15% tax now which is on the low side, but you'll never pay tax on the money's growth for the rest of your life, including when you take it out at retirement. If you do this your take home will be approximately $9 less per paycheck (or a little higher depending on your state income tax). Note that the company match will go into a traditional 401K so you'll likely see two separate accounts on your 401K statements. The choice to go with traditional vs roth 401k is complicated and there are many variables. As a rule of thumb, the lower your current tax rate, the more likely you should be to lean towards the roth. Some exceptions might be if you are close to retirement age and you don't have much saved for retirement, or if you live in a state with a high income tax rate and you don't think you'll still live there when you retire, or if you are living paycheck to paycheck and the slight difference in take home pay would make a difference to you. I've never used your employer's website before, but it looks right to me. You have chosen to contribute 5% of your salary to your 401(k), which should give you the full employer match. If you are still unsure, you can ask your HR department. If there is anything else that you are confused about, feel free to ask another question. Just be careful about the wording of the company matching. Many places will have matching along the lines up "We'll match 50% of your contributions, up to 10% of your salary." So in order to get 5% from your employer you need to put in 10% of your salary. If they just say something like "We match up to 5% of your salary" It could mean you put in 5%, they give you 5%. Or it could mean what I have above. Supposedly your employer will match 5% of your salary. That's 5% from January or your start date. If that was some time ago, you want to max as much as you can to catch up and capture all that you're entitled to. Once you've caught up, throttle it back to 5%. Don't average it out to the end of the year, you might change jobs! They are also letting you blend between a standard and Roth 401K. Research this yourself, but I think for your age and tax bracket, there will be one very correct answer (probably Roth). Go all-in with that. That blending feature is silly, you don't want two 401K accounts if it's not necessary. Not least, two maintenance fees. I did not listen to this advice either lol, but if you are young, put every dollar you possibly can into a 401k, especially if it is Roth. If I had it to do again, I would eat ramen and live in my car if I had to. Every dollar you deposit at age 25 could turn into $30 or more by age 75. Your salary will go up in those years, but not by 30x. Money a young person puts into a Roth is the highest salary he will ever make in his life, by far. And never take money out of a 401k no matter how dire your straits. A 401k is a trust fund, and nobody can touch it. Even if you are sued, even if you are forced into bankruptcy, the 401K glides above all, untouchable and secure. Creditors know this and will often bully you into voluntarily cashing out your 401K. This is a con job, they have no right to the money. Not the answer you're looking for? Browse other questions tagged united-states 401k roth-401k employer-match or ask your own question. 401(k) Contribution When Employer Has No Match? 401k with paltry match or SPY ETF? Any compelling reason to contribute to a 401k if my employer doesn't match? If an employer matches 401k contributions, does each match have its own vesting schedule? How does the IRS handle 401k excess contributions with employer match? Purchasing a rental property: Should I get a 401k loan or a home equity loan? Does 401k on H-1b visa make sense when there is an employer match? Can I use my declining to put money into a 401k (for which they would match up to 5% if I did) to negotiate a higher salary?